If you’re an intermediate or advanced bodybuilder looking to add some thickness to your quadriceps, then higher volume leg training might be a good fit for you. The total number of sets isn’t significantly different from many leg routines. The major difference here is the use of rest-pause training at the end of each body part grouping. After scorching each body part with three solid sets of standard compound lifts, you then employ one giant set of rest-pause repetitions. These are unique in that there is no time limit, and there is no stopping. 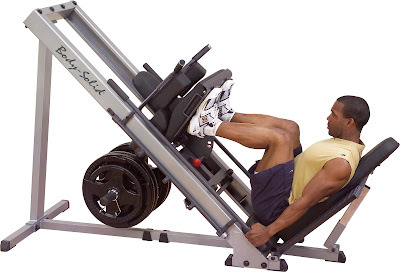 You begin your set of 20 or 30 or 40 repetitions, and you do not put down the weight until you complete that set. You can stop between repetitions and take 5 or 10 or 20 breaths between repetitions if indeed necessary. You’ll notice an incredible pump in legs, lungs, and everywhere else in your body. Here is a high volume leg training routine (which does not include warm-up sets). *Rest pause technique involves completing as many reps as possible, then taking as many breaths are required to complete the set. The set of 20 repetitions may take up to three minutes to complete, and will require several minutes of rest upon completion. This routine will definitely lead to gains in overall leg mass. The volume is high – the complete routine will take about 90 minutes to complete. This routine is designed for off-season use by intermediate or advanced bodybuilders with no known injuries to the legs. You’ll want to adjust your diet, supplementation, and rest schedules to accommodate for the added workload and stress to your central nervous system (CNS). An increase of 500 calories on leg day and the day afterwards is a reasonable diet adjustment. Ensure you are getting at least 7 hours of sleep per night, with 8 being preferable. Supplements such as protein powder and glutamine can help with recovery, but nothing beats good old protein from solid food sources. If you feel yourself feeling weak or run down following a workout of such volume, dose with 1.5 to 2 grams of vitamin C for two days to boost the immune system. High volume training is very effective as long as you train intelligently and support your gains with proper nutrition, diet, and supplementation. This entry was posted in Training and tagged Bodybuilding, Glutes Exercises, Glutes Training, Glutes Workout, Leg Training, Muscle Building. Bookmark the permalink.